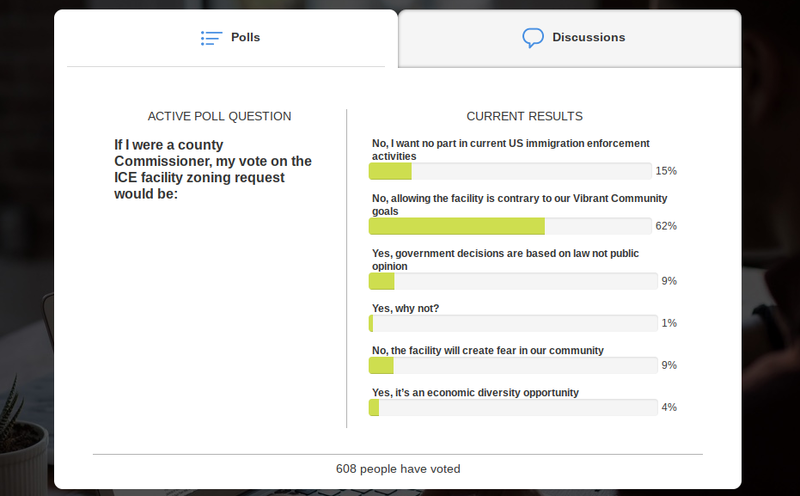 In Elkhart County, Indiana, County Commissioners were seeking public input on a proposed rezoning to build an immigration detention center, which would house up to 1,400 immigrants being held and facing possible deportation. Detention centers and correctional facilities are allowed in Elkhart County within certain zoning districts, but only through an additional permitting process which includes a review and an approval by the Commissioners or an appointed board (the board of zoning appeals). As certain land uses could create conflict within the community, an additional public hearing process is required to approve these types of land uses. Core Civic, a private company, had applied to build a detention center and operate it on behalf of the federal Immigration and Customs Enforcement (ICE). The issue of immigration is an emotionally-charged one for individuals on both sides of the aisle. While county commissioners had received hundreds of emails and social media comments about the issue from people all across the country, they were specifically interested in the opinions of residents within Elkhart County – those they were elected to represent. At the same time, they wanted to ensure that public dialogue on such a controversial issue remained respectful – a challenge that they had observed on social media sites such as Facebook. Thus, they decided to utilize PlaceSpeak to collect feedback from County residents. Participants could read through resources and reports on the issue and have their say in several ways: by completing a survey, taking a poll, or leaving a comment on the discussion forum. By leveraging PlaceSpeak’s unique geo-verification technology, the County was able to limit responses to area residents and observe the distribution of participants across its seven communities. While the majority of participants came from Goshen, diverse perspectives from all across the County were also well-represented. Within a week of its launch, the issue had garnered significant attention with over 5,200 page views and nearly 800 respondents. Despite the contentious nature of the consultation, the majority of the dialogue remained respectful and productive. By requiring that participants sign up with their real names, PlaceSpeak sets the expectation that participants take responsibility for their comments, reducing the incentive for trolling, spamming, and other negative online behaviour. As PlaceSpeak authenticates participants’ location to physical location (i.e. residential address), Civic Core could confidently identify that residents within the County were opposed to the project. On January 22, 2018, Civic Core withdrew their rezoning request and were no longer considering Elkhart County as a location for the immigration detention center. See Elkhart County’s online consultation here.